Well, I ran into a road block this afternoon that took some time to sort out. I built the FET VFO and Follower (for isolation) portions of the VFO…but could not get it to oscillate. After checking wiring and voltages, I pulled another 2N4416A from the junk box and checked it with my M-Cubed semiconductor checker. I noticed that it showed the DRAIN and SOURCE pins reversed from what the datasheet indicated. I rebuilt the two stages using the info that the M-Cubed checker showed me and the VFO worked. I got these 2N4416A’s from a reputable USA company but now wonder if maybe they were clones from an overseas location. Bottom line…never assume anything, always check and measure everything. 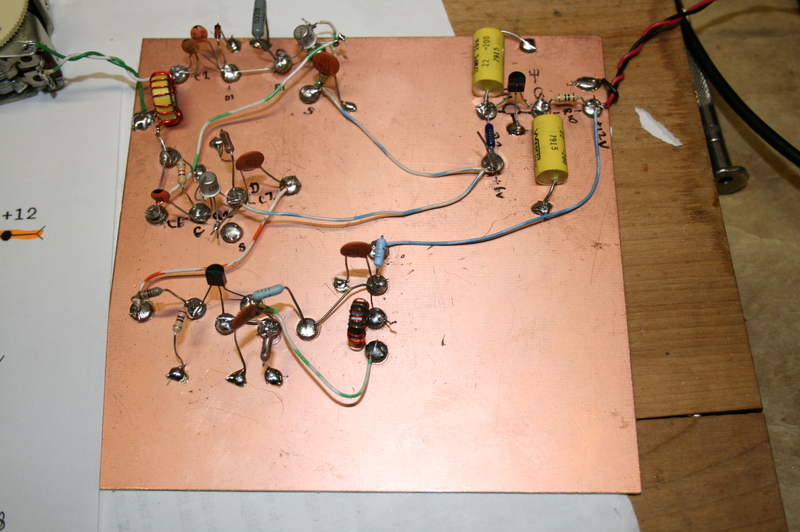 Have the BUFFER AMP to build and then do some tweaking and final measurements. This project is a joint effort of Todd, VE7BPO and myself for an article for the Michigan QRP Club’s quarterly publication called “The 5 Watter” (T5W). Todd suggested this article during the winter months and it has been a fun adventure so far. I sort of got side tracked this last month and just now am getting back on track with the project. The original 8640-jr project was done by Wes, W7ZOI…it is a three band VFO that develops a 13 to 30 MHz signal which is then ran through a couple of dividers to result in 3.5, 7 and 14 MHz VFO signal source or can be configured to run from 3.4 to 31 MHz as a signal generator. Always fun to snuff solder fumes and figure out why things don’t work the first time as planned <smile>. Started assembling a 8640-jr VFO tonight. Should have done this a month ago but been rather busy with no-related bench stuff lately. Built and tested the +6 volt strip and now onto the oscillator and buffer stages. Located and sorted the parts for the entire project…now just need to build it, then test and measure the three stages. This is for a T5W article that VE7BPO inspired a couple of months ago. Received the 4×20 (4 lines, 20 characters per line) LCDs. This made using the CW Decoder so much more enjoyable to use. I changed the code a bit to put the WPM rate and my call sign on the first line and then three lines of cw. I need to take a picture of the setup now as it is easier to read the CW as it is displayed and then post it here on the blog. Hello to Fred, KD8IXP. He is a local ham who is always bugging me about updating my blog. He just received two PIXIE transceiver boards, and has promised me to get on the air with one of them so I can hear what it sounds like. I will report back on this when he finally fulfills his promise!!! Been doing some Arduino stuff on the workbench. I saw an article that used an Arduino for a CW Decoder. Built it but it didn’t show anything on the LCD. After some checking, realized that the schematic I was using and the software I had loaded onto the Aruduino didn’t match as far as LCD wiring. 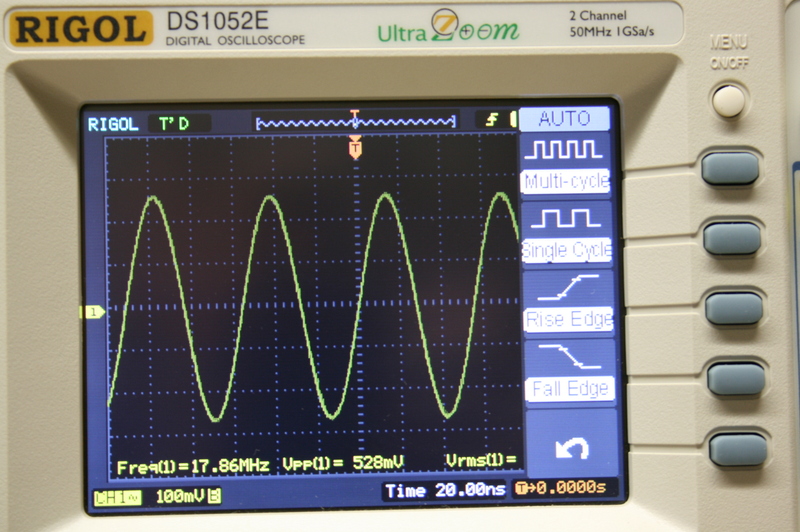 After some experimenting with various pin-out configurations, I ended up with a working cw decoder. I also built up a breadboard for future Arduino experiments and prototyping. I have three books that I bought this last year that deals with Arduino projects and Ham Radio. This breadboard will be perfect for doing most of the experiments detailed in each of the three books. I am also doing a VFO/Sig Gen project with Todd, VE7BPO. All of the project will be detailed in the Michigan QRP Club’s quarterly publication called the T5W. Todd is doing most of the work, and my part will only be the VFO section. It is based on a project done by Wes, W7ZOI in 2009. Called the 8640 –JR (a humorous namesake after the famous HP 8640 signal generator) this signal generator uses only 1 VFO but covers three ranges by applying HC74 series CMOS logic for frequency division. That is it for now. Stay tuned for solder fume snuffing while the temps are chilly and the ground is white! I have been adding to my Elecraft KX1 rig. Added the 30 meter mod and as of tonight, have built and installed the ATU mod. I plan on using the KX1 while we are in the RV and having the ATU is a definite plus with a non-resonant antenna. I received the Ten Tec Rebel rig last week. Checked it out and all seems fine, but have to wait till Christmas morning before Santa will let me play with it. 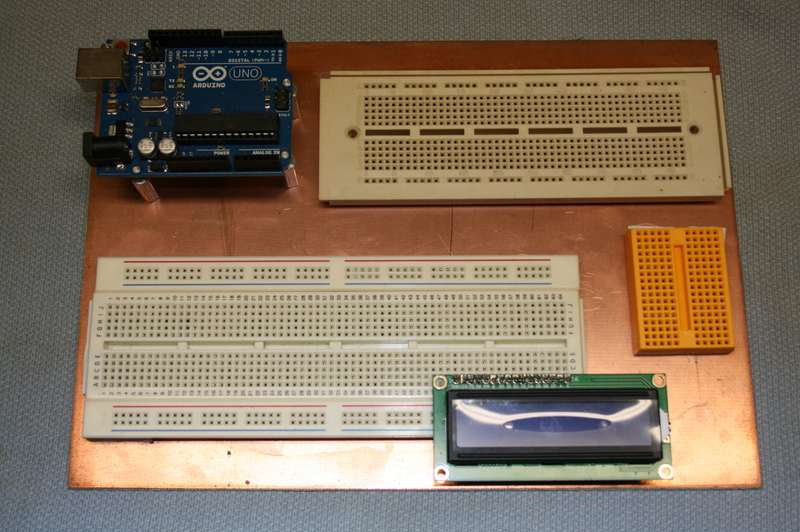 But, this will be a big part of what I plan on doing this winter…ARDUINO learning! I do have some Arduino projects I might start now that all the outside work/chores are done. 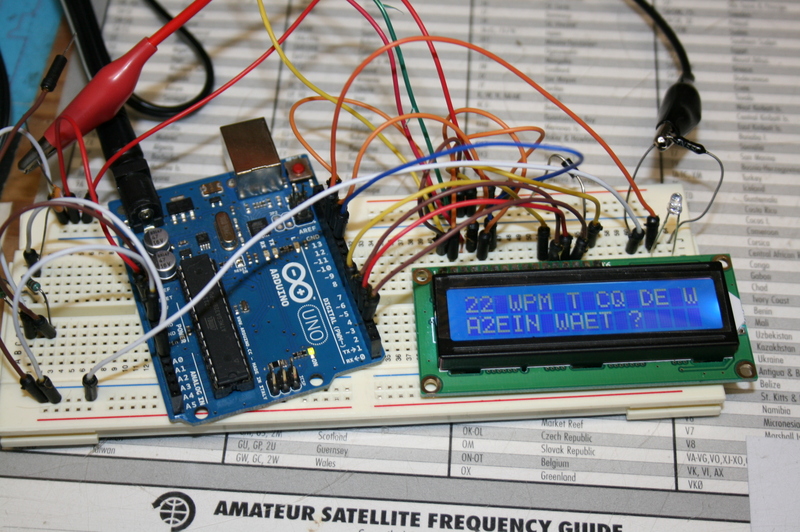 I do want to try to use an Arduino for a CW decoding project. Have seen a couple of blogs that have done some work in this area, so I won’t have to start from scratch. The weather in November was quite an eye-opener for most of the northern part of Michigan…but December has proven to be quite tame and I hope it stays that way. I might even try to get some antenna projects launched if the current temperature trend continues. That’s it for now…stay tuned. Well, we had our first flakes of white stuff today, so guess summer is actually over. I spent most of the summer hiking and walking the many trails around our home town, but doubt I will be doing a lot of that for the next few months. The wifey has told me that we are staying put this winter as the weather forecast for most of the areas that we thought about going to during the colder months are not going to be much better. To be wet and cold is worse than snowy and cold in my book. When your in a 30 foot RV and can’t get out to do things, well it is better to stay home and play with all the toys! I know I want to play with a lot of Arduino projects this winter and my spectrum analyzer I got at Dayton this last spring, so that should keep me busy for awhile. Still have a lot of kits to build and some homebrew ideas to work on, so won’t be bored. I have even thought about doing some antenna experiments. I would really like to increase my operating time on CW this winter. I keep saying that every year but never quite get around to it. To be retired and not have the time to do things…go figure. But who knows, I might just do it this winter season. Have a few more winterizing chores to complete and then settle in for a few months of white “bear and grin it” weather…<smile>. Todd, VE7BPO, has started a blog that looks to be excellent and a outstanding replacement for his web site that he had to terminate this fall. To see his new blog, go to http://qrp-popcorn.blogspot.ca/ and see what he is already posted. He just conclude a three part series on a receiver called the “Funster”. Leave it to Todd to add excitement to a new project! ….PLEASE DON’T POST THE URL IN PLAIN TEXT…. Todd, VE7BPO, who runs the “Pop Korn” site for homebrewers may have to discontinue the QRPHB web site (http://www.qrp.pops.net/) all together. He and the web master have been having bandwidth problems and it looks like the issues may continue for the foreseeable future. Throughput has been really bad the last few days, and today the site server simply froze up due to a lot of download requests. At present, Todd has taken the site off-line and will probably not bring it back up. Stay tuned for further developments. My personal thanks to Todd for all these years of service and sharing with the homebrew community. On the plus side, he will have more time to devote to experiments and testing/measurements that would normally be spent on web site updates. I came across Todd’s work and site back in the late 90’s and have been a fan ever since. He and his site will be missed! Wanted to mention what I found by comparing the molded inductor verse the use of a toroid for the RF Phase Shift. Found that the molded inductor (molded inductor for the primary and four turns of hook-up wire for the secondary) has at least a 10 dBm loss at 7 MHz. I wound a toroid for the same component with ten turns for the primary and four turns for the secondary on a FT37-61 and had only a 2.8 dBm loss at 7 Mhz. So, using the toroid is the better choice. But, modeling this new insight with LTSpice still leaves me with some doubt. The RF level going into the Detector stage is still not up to 700mv which I think would be necessary for good sensitivity. I doubt I will continue on with this project in its present form. Still have some desire to use the LO ceramic osc and hook it up to a homebrew NE602/LM386 receiver I build a few years ago to see if that would work. Have discovered some really interesting functions for LTSpice…things I wish I had known years ago. Still learning how to set-up sources for driving oscillators, mixers, etc and what types of analysis’s tell me what type of information. This learning has turned out to be more fun that I first imagined! With the fourth just around the corner, I doubt I will get much done till next week. I have started to do the 30 meter mod for my KX1 and also want to do the auto tuner kit while I am in the kit building mood. Hope everyone has a good and safe Fourth of July weekend!